Hundreds of privately-owned flats in one of Glasgow's most ethnically diverse areas are to be bought out in a bid to end slum housing conditions. Glasgow City Council and the Scottish government are supporting a £9.3m plan to purchase a majority of 579 flats in four tenement blocks in Govanhill. The aims is to end overcrowding, poor landlord practice, a lack of factoring arrangements and high tenancy turnover. 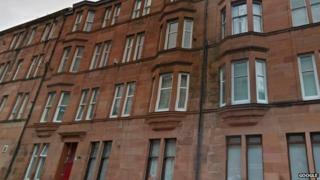 The flats will be bought and run by Govanhill Housing Association. The blocks earmarked for purchase are located between Calder Street, Allison Street and Dixon Avenue. The council and housing association have devised the South West Govanhill Property Acquisition and Repair Programme to tackle problems in the area. Under the scheme, the housing association will identify and buy properties and carry out improvement work to bring them up to a lettable standard. Glasgow City Council has also set aside £500,000 of its fund to address problems in properties outwith those being block purchased. Bailie Liz Cameron, the council's executive member for economic development, said the plan would bring an economic boost to the Govanhill area and improve the lives of residents. "It has been obvious that a longer-term solution to issues with private sector housing in Govanhill has been required for some time," she said. "The council has already invested substantial sums in maintaining the housing stock in the area, but it is clear that difficulties with the way property is being managed have not gone away. "By securing this funding we can now implement the strategy of bringing tenement blocks into the social housing sector so they can be managed properly." It is anticipated that Govanhill Housing Association will take on responsibility for factoring the purchased tenement blocks when they secure a majority of ownership. Housing Minister Margaret Burgess said: "Since 2010, we have been working with Glasgow City Council and Govanhill Housing Association to help tackle the poor condition of some properties in South West Govanhill, resulting in the purchase of empty properties and improvement works to the back courts. "We are providing £4.3m for a pilot initiative to allow Govanhill Housing Association to acquire property, which will enable it to take on more factoring responsibilities and ensure a more effective maintenance regime. "We will continue to work with partners to develop a longer term strategy to tackle the problems in the area."